Learning materials for computer-related stuff are hardly known to be interesting and interactive. You read some docs then start to mess with stuff, right? 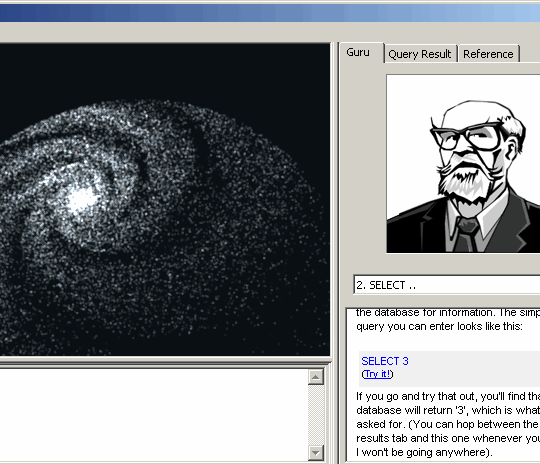 GalaXQL is interactive SQL tutorial that lets you mess with stuff right from the start and in a really cool way. GalaXQL generates database that describes imaginary galaxy – with thousands of stars, planets and moons as well as their attributes (like coordinates and distances). Then it offers you lessons on SQL, using galaxy rendering to display changes you make in database. It is extremely visual and way better than modifying abstract data. App comes with twenty lessons on different SQL queries (syntax used is SQLite). It stars with easy stuff but gets somewhat hard later with complex nested queries. Nothing impossible but don’t expect to complete whole tutorial in single sitting. Free and open source under under BSD-like license. « Are you prepared for computer meltdown? That sounds great. Where was this like 5 years ago when I had SQL manuals as big as my head trying to figure that stuff out. Geeze! That was one of the toughest fights I ever fought. I don’t really need SQL at moment but had this bookmarked for some time and going through lessons when I have free time. Might get handy later with WordPress and stuff. This app actually does seem really interesting, and I’ll probably try and check it out some time this weekend. As to the quick replies.. I’m from canada and I’m at work at the moment. I have email and feeds open in firefox and constantly running all day. I switch back every half hour or so to see if there’s anything interesting going on. On time zones it’s hard to say what reduces reaction time. While I match with some people that work when it’s evening her, personally I am usually first to reply on blogs in same time zone. The professor’s “That’s wrong” expression made me laugh. It’s amazing how a little humor can turn learning into an entertaining experience. One on C is on my todo list, but as it will practically require me to write a new compiler, don’t hold your breath. This seems like it could be great, I will have to give it a try. At varsity while I was learning SQL for the first time, I actually had a friend who said – ‘..the day I understand this stuff is the day I rule the universe’. Be sure to share your opinion after you try it.